One of the ways to invest in bonds is through the primary markets, by subscribing for new bond issues. Because the new issue process and related terms can be unfamiliar and intimidating for new bond investors, we aim to explain the overall new bond issue process and timeline in this blog post. 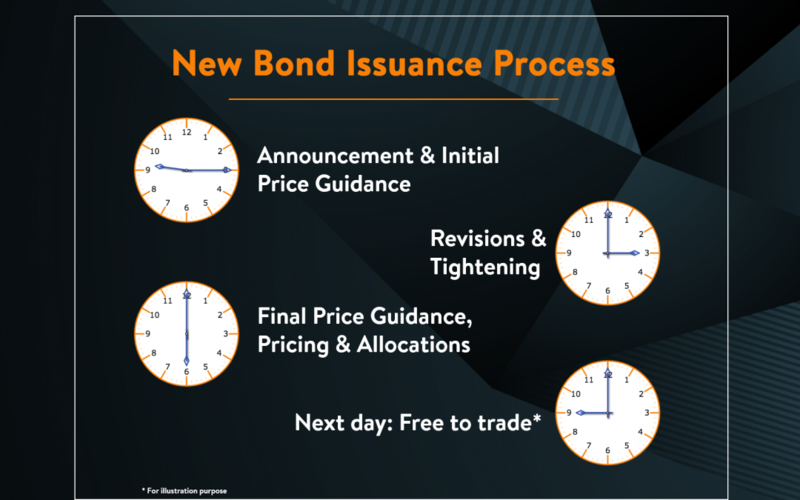 Below is a timeline of events for a typical new bond issuance. Let’s take the following 3 recently issued bonds as examples. This indicates the yield to maturity at which the bond will be issued. 7.625% area means that the final issue yield will likely be 25 bps on either side of 7.625%, or 7.375%-7.875%. Final pricing is usually lower than the IPG and bankers as well as investors refer to the lowering of the expected bond yield over the marketing process as a ‘tightening’ in the pricing. Final pricing guidance or FPG is the stage of tightening between IPG and final pricing where pricing is brought lower or tighter by one step from IPG, but where pricing might still have some room to move tighter if the demand from investors allow. The final pricing for this bond was 7.125%, 50 basis points below IPG, with an issue size of USD 350 million. After the bond has been priced, bankers release the bond allocations by region and investor type. The China Fortune Land 7.125% 2022 bond drew total orders of over USD 2.5 billion. 99% of the bonds were allocated to Asian investors and 1% to European investors. By investor type, 85% went to fund managers and asset managers, 12.5% to banks, and 2.5% to private banks. Unlike the case in the previous example for China Fortune Land, where pricing is stated as a yield, IPG for investment grade (IG) bond deals is typically stated in terms of a spread over the benchmark. For U.S. dollar issues, the benchmark is generally the U.S. Treasury note or bond which matches the tenor of the new bond issue. In this example, the benchmark is the 3-year US Treasury. The spread over benchmark, or IPG, on this deal is 165 basis points or 1.65%. As the 3yr US Treasury was trading at a yield of 2.14% on the announcement day, the yield to maturity for the Bank of Baroda deal works out to be 2.14% + 1.65% = 3.79%. Final pricing for this bond was T+145 basis points, or 2.17% (3yr Treasury yield on 28-Mar-19) + 145 basis points = 3.62%. Since this bond was issued at 99.662 (issue price) with a coupon of 3.5%, the yield to maturity on the day of final pricing works out to 3.62%. Final pricing was 20 basis points tighter than the IPG with an issue size of USD 500 million. This bond drew final orders of over USD 780 million. Asia accounted for 77% of the final deal while EMEA accounted for 23%. By investor type, funds and asset managers accounted for 47% of the transaction, followed by banks at 30%, public institutions 20%, and the rest going to private banks and other buyers. IPG for IG issues is quoted as a spread such that if there are changes in benchmark yields over the course of the bond issue process, investors are aware that their credit spread or return of their portfolio over the benchmark, would remain constant. Other benchmarks include 3-month LIBOR (3mL+) for floating rate issues, Mid Swaps rate (MS+) for Euro-denominated issues, etc. Tenor: Perpetual Non-call 5 year, indicating that the bond has no maturity from issue date but can be called back by the issuer from as early as 5-years from issue date according to a call schedule as stipulated in the terms and conditions of the bond prospectus. Final pricing for this bond was 8%, which is 25 basis points tighter than IPG with an issue size of USD 2 billion. This bond drew final orders of over USD 6.6 billion. This bond is an Additional Tier 1 bond, which means that the bond proceeds will be used towards the bank’s tier 1 capital requirements. You can track new bond issues conveniently from the new issues ticker on the BondEvalue App. Mobile App users can turn on App notifications to receive new bond issue alerts in real time via the BondEvalue App. The header in BondEvalue’s app shows the stage at which a new bond issue is at. ‘New’ indicates new bond deals announced that morning. Investors who are interested in a new bond deal after it is just announced may call their bankers/brokers to place an order at a price/yield that is at or around the IPG, depending on the deal progress. ‘Priced’ indicates that the bond deal has been priced and no further orders will be accepted. At this stage, the size of the deal will be available, along with the final pricing. As mentioned earlier, IPG minus final pricing will give you the extent of ‘tightening’, which generally indicates the demand for that bond deal and how successful it is perceived to be. The markets generally recognize that the greater the ‘tightening’ in pricing from IPG to final, the greater the implied demand for that bond deal. Bonds that have been priced usually begin to trade in the secondary market after a short time gap post final pricing. Once the bond begins to trade, it is termed FTT (free to trade). © Copyright BondEvalue 2019, All Rights Reserved.